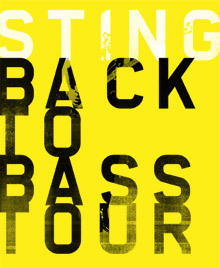 Sting.com > News > Sting - BACK TO BASS - New Tour Announced! Live Nation is pleased to announce that this fall, Sting will embark on the Back to Bass Tour throughout North America as he celebrates the 25th anniversary of his solo career by taking it back to bass… all the hits, stripped down, as they haven't been played in years. In support of his forthcoming box set collection Sting: 25 Years, slated for release on September 27, the tour features Sting backed by a 5-piece band in an intimate theatre setting. Beginning in Boston on October 21 at The Wang Theatre at the Citi Performing Arts Center, the tour will extend across the US and Canada. Cities announced today include Philadelphia, Washington DC, Toronto, Chicago, Detroit, Miami, Dallas, Houston, Denver, Phoenix, Los Angeles, San Francisco, Seattle, and Vancouver. Additional dates will be announced in the coming weeks. Back to Bass finds Sting performing songs spanning his dynamic and enduring solo career, from his 1985 debut The Dream Of The Blue Turtles to his latest release, Live in Berlin, plus a selection of The Police's greatest hits. Highlights include the Grammy winners "Brand New Day" and "If I Ever Lose My Faith In You" plus fan-favorites "Englishman In New York," "Desert Rose" and "Roxanne." Sting will be joined by a band including his longtime guitarist Dominic Miller, Rufus Miller (guitarist), Vinnie Colaiuta (drummer), Peter Tickell (electric fiddle), and Jo Lawry (vocalist). To commemorate the 25th anniversary of Sting's solo career, the definitive box set Sting: 25 Years, will be released on September 27, 2011 and features three CDs and a previously unreleased live DVD, Rough, Raw & Unreleased: Live at Irving Plaza. The discs are housed in a hardcover book featuring rare photos, complete lyrics and newly written commentary by Sting. In addition, Sting: The Best Of 25 Years, comprised of 12 remastered tracks including several remixes and newly unearthed live recordings, will be released on October 18, 2011. The Fan Club presale for performances in Boston, Philadelphia, Washington DC, Toronto, Chicago, Miami, Los Angeles, and Vancouver will begin at 10AM (local time) tomorrow, Tuesday, September 13. Legacy Fan Club members will be given a one hour advance window at the start of the presale followed by a presale to all members beginning at 11AM (local time). Tickets will go on sale to the public on Monday, September 19 at 10AM (local time). The Fan Club presale for performances in Detroit, Dallas, Houston, Denver, Phoenix, San Francisco, and Seattle will begin at 10AM (local time) Tuesday, September 20. Legacy Fan Club members will be given a one hour advance window at the start of the presale followed by a presale to all members beginning at 11AM (local time). Tickets will go on sale to the public on Monday, September 26 at 10AM (local time). VIP Packages are available through VIP Nation, including premium seats, exclusive merchandise and more. Am I crazy or are there no New York area dates yet? Please stop here!!!! How about just Acoustic Guitar? I was wondering what Sting would do to top the Symphonicity tour. I personally love Concert Bands and Symphonic Wind Ensembles, so I thought that the last tour was his best and will be impossible to top...and I've seen most of them, including the Police (way back when). My son and I had a discussion recently, and we both came to the conclusion that the only way Sting will sound any better would be if it was just him, alone...and a guitar. Guess I'll have to wait to find out if this concert will surpass the show last year at the Apollo Theater ( I have my doubts) as I don't see a NYC or Jones Beach tour date...yet! I haven't looked at the playlist for the "25 years" collections yet. I hope there's a rendition of "Fragile" with just Sting and a guitar. 18 years ago, he played at the Little Theater in Madison Square Garden (The Paladium) and when the band took a break he did a breath-taking rendition of "Fragile", alone, with just the guitar. I've waited for that version to show up somewhere, but it never has. Maybe my wish will be granted somewhere in the new collection. Can we have french dates ???? Paris, Montpellier or Nimes ? 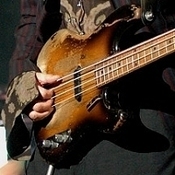 Is back to bass, a sort of tribute for Winehouse ? I can't find the presale password anywhere! Can someone help me out? I am hoping to finally see Sting up close for my 40th birthday and anniversary! Hoping we get tickets to the San Francisco show and make it a great trip - especially since we live in Texas!!! I just joined the fan club when I purchased tickets on Ticketmaster :o) does anyone know how I get my membership information? I need the password for the pre-sale in Illinois so I can buy tickets for my sister to go for her birthday :o)Is there someone with the fan club I can contact and give them my Ticketmaster order number so I can get the password? Hope there will be uk dates, Manchester would be execelent. The Legacy seats that were offered were quite bad. There was nothing remotely close to the stage and we're supposed to be the most avid of fans. I am, again, greatly disappointed! You promise 4 pres-sale tickets for each show for (Legacy) fan club members but I actually couldn't purchase more than 3 total...for 2 different shows. The error message I received said I exceeded the quota. Is LiveNation in tune with your ticket quotas??? Kinda disappointing if I wanted to go to more than 2 shows, no? Please! Welcome to Japan! Please!!! ...in Paris !!!! 25 years after !